Parkland Publishing features the books, travel writing, and photography of Robin and Arlene Karpan of Saskatchewan, Canada. Our latest book, Saskatchewan's Best Scenic Drives, which guides you on fabulous driving routes throughout the province, is available from bookstores and selected gift shops. Contact us at info@parklandpublishing.com or phone 306-242-7731 and we will let you know if there's an outlet near you that is carrying the book. Alternatively, you can order directly from us. See our order page here. Take the road less travelled to discover spectacular river valleys, natural grasslands, boreal forest, awesome viewpoints and much more on drives along Saskatchewan roadways. See more. Whether you're an accomplished photographer expanding your horizons, or you simply want better mementos of your vacation, this book helps you find Saskatchewan's best. See more. Saskatchewan abounds with wonderful places to see, but The Great Saskatchewan Bucket List cuts to the chase and takes you to the best of the best. See more. April 11, 2019: Robin and Arlene Karpan were awarded the Travel Media Award in the 30th annual Saskatchewan Tourism Awards of Excellence for their book Saskatchewan's Best Scenic Drives and other articles and photos published in 2018. 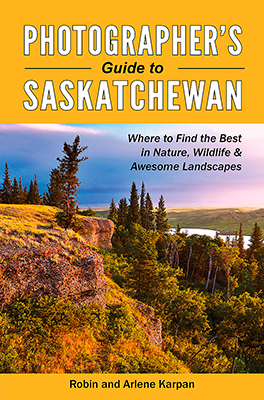 January 7, 2019: Saskatchewan's Best Scenic Drives and The Great Saskatchewan Bucket List were among the Top 10 Bestselling Non-fiction Titles for 2018 at McNallyRobinson Booksellers in Saskatoon. 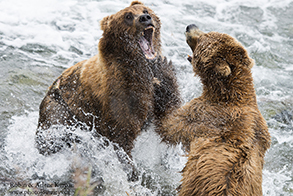 June, 2017: Our photo of two Alaskan Brown Bears fighting over prime fishing spots in Katmai National Park, Alaska, won 1st Place for the Best Action Photo at the Travel Media Association of Canada Awards. No. 1 Bestseller of 2017: SaskBooks (Saskatchewan Publishers Group) announced their list of bestselling Saskatchewan-published books for 2017. Our title, The Great Saskatchewan Bucket List, topped the list as the Number One Bestseller. This is the sixth year in a row that the Bucket List was in the Number One spot. 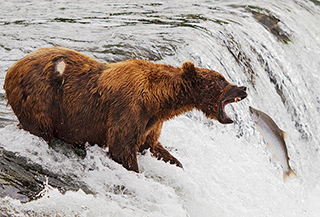 More Awards: June, 2016: Our photo of a brown bear fishing for salmon in Katmai National Park, Alaska, won 1st Place for the Best Action Photo at the Travel Media Association of Canada Awards. June, 2016 newspaper feature on Robin and Arlene's work. Robin and Arlene won the Travel Media Award in the 2014 Saskatchewan Tourism Awards of Excellence.